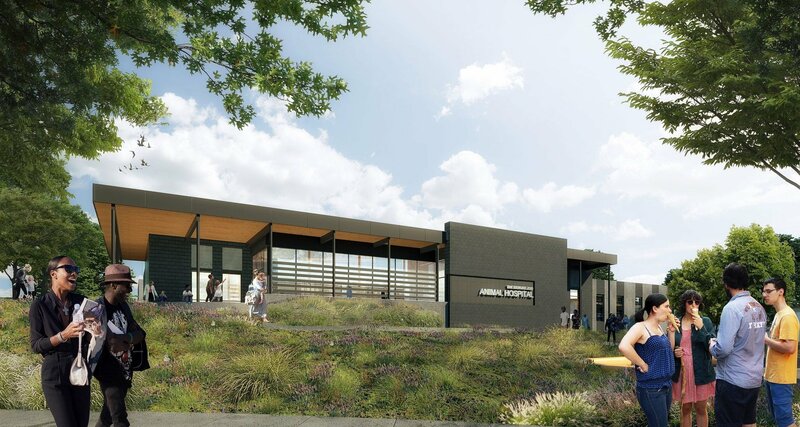 Denver Zoo Constructing State-of-the-Art Animal Hospital -- And You'll Be Invited In! New facility will be open to the public in 2020. The Denver Zoo and Mayor Hancock held a groundbreaking ceremony on February 6 to begin construction on the new, state-of-the-art Helen and Arthur E. Johnson Animal Hospital. It's a big step forward for the zoo in providing top-notch care for its 3,500 animals, as well as an exciting addition for visitors. The 22,000-square-foot facility will replace the current, decades-old hospital. According to the zoo, it will house a world-class diagnostic laboratory, indoor and outdoor holding and quarantine spaces, and state-of-the-art treatment rooms and surgery suites. It will also be equipped with the latest technology, including one of the only animal hospital CT scanners in the country. Its design includes considerations for noise, views, and daylight to ensure animal comfort, and will be built to LEED Gold standards. And the coolest part for zoo goers? You'll get to visit! Once the facility is finished, zoo visitors will be given an interactive and immersive look into how the zoo cares for its animals. "What's most exciting about the new hospital is what guests will experience. There will be outdoor areas for guests to eat and relax, as well as space for impromptu animal demonstrations. Inside, there will be an elevated lobby that provides unobstructed views into the treatment rooms, surgery suite, and laboratory. It will be far more than a peek behind the scenes...offering visitors an unprecedented look at the amazing work our veterinary team does every day," the zoo said. The zoo was able to fund the facility thanks to the Denver voters, making it all the sweeter that it will be open to the public. The Elevate Denver Bond, which passed in 2017, helps fund the project. "The community continues to support the zoo and all that it endeavors today, and we're here because the people of Denver said yes to the largest general obligation bond issuance to date when they approved the Elevate Denver Bond," said Denver Mayor Michael B. Hancock in a statement. "The residents spoke loud and clear and said yes, and also said culture matters to us here in Denver. The zoo matters to Denver." What do you think? Share your thoughts with us in the comments below. Escape reality with these hidden nature spots in Colorado!